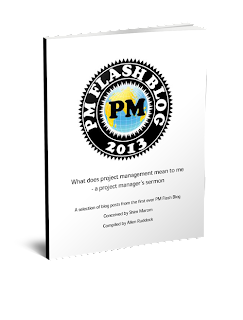 Musings on project management: My backlog is blocked! Yikes! My backlog is blocked! How can this be? We're agile... or maybe we've become de-agiled. Can that happen? Ah yes, we're agile, but perhaps not everything in the portfolio is agile; indeed, perhaps not everything in the project is agile. Coupling? Coupling is system engineering speak for transferring one effect onto another, or causing an effect by some process or outcome elsewhere. The coupling can be loose or tight. Tight coupling: there is almost complete transference of one effect onto another. Think of how a cyclist puts (couples) energy into moving the chain; almost none is lost flexing the frame. In the PM domain, it's coupling of dependencies: we tend to think of strong or weak corresponding roughly to tight or loose. But buffers may not do the trick. We need to think of objects, temporary or permanent, that can loosen the coupling from one backlog to another (agile-on-agile), or from the agile backlog to structured requirements (agile-on-traditional). With loose coupling, we get the window pane effect: stuff can go on in environment A without strongly influencing environment B; this is sort of a "us vs them" approach, some might say stove piping. Obviously then, there are some risks with loose coupling in the architecture that bear against the opportunity to keep the backlog moving, to wit: we want to maintain pretty tight coupling on communication among project teams while at the same time we loosen the coupling between their deliverables. Invent a temporary object to be a surrogate or stand-in for the partner project/process/object. In other words, we 'stub out' the effect into a temporary effect absorber. Invent a service object (like a window pane) to provide the 'services' to get from one environment to another. Of course, you might recognize the second approach as a middle layer, or the service operating system of a service-oriented-architecture (SOA), or just an active interface that does transformation and processing (coupling) from one object/process to another. With all this, you might see the advantages of an architect on the agile team!